The latest New Nintendo 2DS XL is based off Link's infamous Hylian Shield. Nintendo recently unveiled a brand new mode of New Nintendo 2DS XL based around Link’s Hylian Shield from The Legend of Zelda series. The Hylian Shield 2DS XL is set to release later this summer and will be sold exclusively at GameStop. 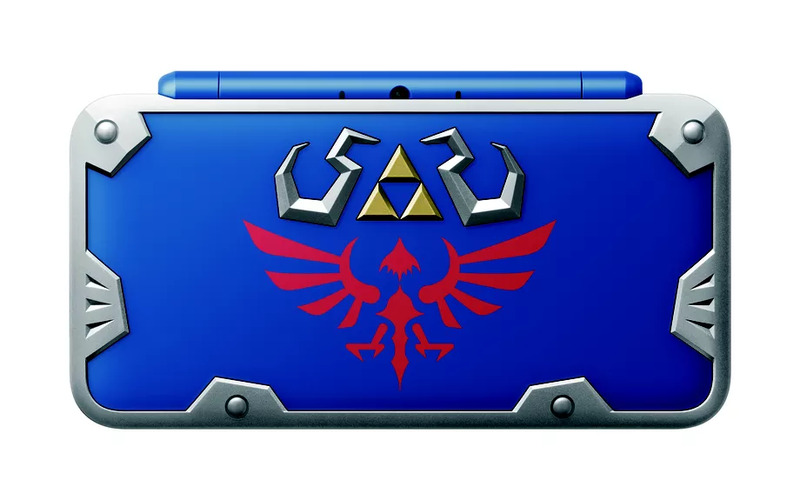 In addition to the sleek design, the Hylian Shield 2DS XL will come preloaded with The Legend of Zelda: A Link Between Worlds. For those interested in purchasing a Hylian Shield 2DS XL, it will set you back $159.99 and will officially be available as of July 2. The Hylian Shield 2DS XL isn’t the first special edition of New Nintendo 2DS XL, which first released last summer. Other stylish versions of the 2DS XL include the New Nintendo 2DS XL Poké Ball edition and the New Nintendo 2DS XL Pikachu edition. Unlike its 3DS counterpart, the 2DS XL plays games exclusively in 2D. Although, it still includes the same built-in amiibo support, processor, extra shoulder buttons, and analog button found in the New Nintendo 3DS XL. Planning on purchasing the Hylian Shield edition New Nintendo 2DS XL, or do you prefer playing on the Nintendo 3DS? Let us know your opinion of the latest 2DS XL design down in the comments below!